This is Marc Sambola, a Catalan guitarist. I met him a couple of years ago at Casa Luthier in Barcelona where he used to work. Nowadays he is a full time musician. He works as a composer, arranger, teacher and guitarist. He writes music for theatre plays, like for instance El Projecte dels Bojos or arrangements like Le Llaman Copla. 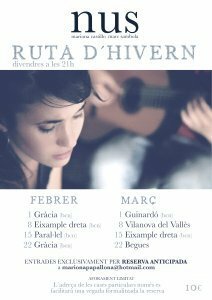 He can be listened to in Ruta D’Hivern, small concerts in private houses, every Friday in Barcelona, together with singer Mariona Castillo.